When trips are repeated or invoices are copied with common data, it makes sense to save the immutable components in a template. These templates can be recalled by the button. So you can, for example submit a template for a trip to the airport with a fixed price. After the call, only the date and the name of the guest must be entered to save the trip. Pre-defined are trips with 1,2 or 3 extra stops as well as collecting trips with 2,3,4,6 or also 8 guests. You might change/add fields by hitting . Details on additional fields could be fined here. 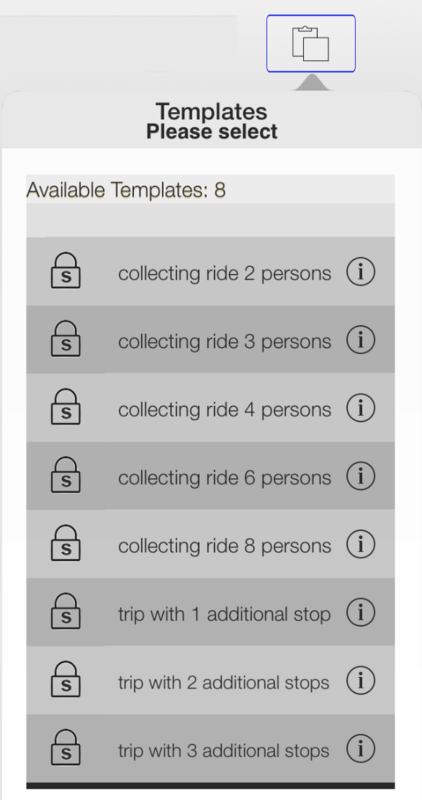 Dieser Eintrag wurde veröffentlicht in Taxi Data Manager english und verschlagwortet mit additonal stopps, collecting ride, effective, templates . Lesezeichen auf den Permanentlink.